Edward Roworth (South African, 1880-1964). Historic Cape Dutch homestead, Morgenster, Somerset West, Western Cape. Edward Roworth initially studied under Tom Wostyn at Heaton, then briefly under Hubert Herkomer at Bushey. He finally studied under Henry Tonks at the Slade School of Art. Arriving in South Africa with British forces during the Anglo-Boer War once the war was over he decided to stay and settled in Cape Town, where he set up a teaching studio. 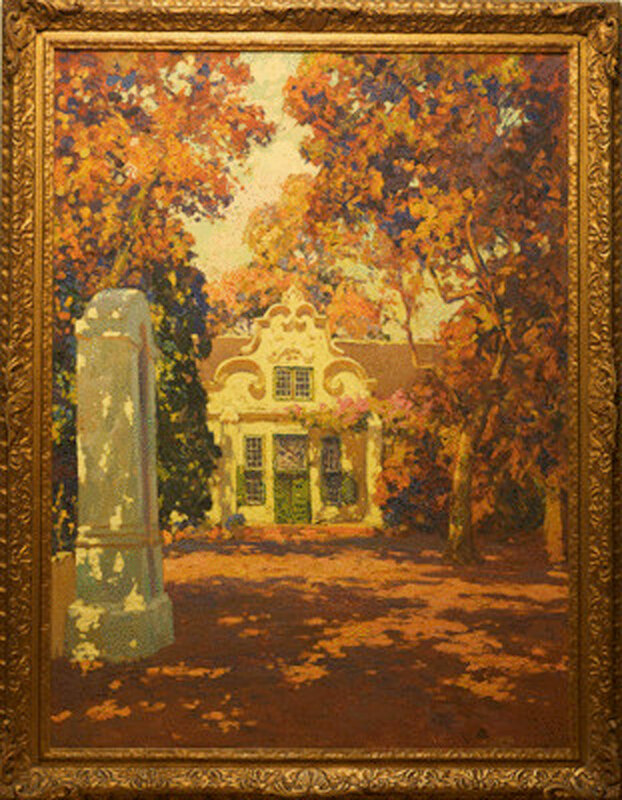 In 1908 he was elected President of the South African Society of Artists, doing so again in 1918–20 and 1933–36. The Homestead's six perfectly proportioned gables are acknowledged in the historical records of Cape Dutch architecture. The front 'holbol' gable, with its delicate scrollwork and scallop shell apex framing the morning star, is considered one of the finest existing examples of baroque style in the Cape, and has been adopted as the Morgenster Estate logo. This large painting is produced in oil on canvas and within the original gilt gesso frame.